At the end of July, The Grand Cork Experiment was launched with as much fanfare as could be mustered in the wine media. According to an article in The Drinks Business “a space in Soho was transformed into a laboratory to test whether the pop of a cork had a more positive impact on the wine tasting experience than the click of a screwcap.” A few months later, at the end of September, the results were announced with even greater fanfare – this time in the national press. Take The Telegraph headline for example: “The great wine debate: Corks really are better than screw-tops, Oxford study finds”. And how did we conclude that corks are better? The same wine is apparently preferred if, just prior to tasting, the sound of a popping cork is played to the taster through headphones, when compared to the sound of a screwcap being opened. Right, so that is sorted then, and it’s all proved by those boffins at Oxford. Well, not really. Firstly, let’s take a look who funded the experiment, and who else was involved. The funding body was APCOR, who “exist to promote and value cork as a raw material of excellence, and its products. We work to represent and promote the Portuguese cork industry worldwide.” That’s not a good start for unbiased research, but not necessarily a problem if the researchers are given complete control of the experiment and allowed to publish the results regardless of what they show. Charles Spence of Oxford University has a good reputation as an academic in this field, and we are told in July that he designed the experiment. But I doubt very much that he designed the whole experience that experimental subjects were exposed to. This seems to have been the work of Bompas & Parr, who were employed by APCOR. Whatever this company does in general, it is certainly more akin to marketing and brand-building than it is to science. In the absence of any scientific report, let alone peer-reviewed paper, it seems that the best description of the experiment is given in another article from The Drinks Business. The event was clearly very showy and expensive, it was viewable through windows opening onto a Soho street, and designed to impress. Certainly it was not how scientific experiments would normally be conducted. The experimental bit comes in slide number 9 of The Drinks Business presentation: Each visitor is “placed in a chair and given headphones, before being asked to rate four wines according to their quality, intensity and how much they invoked a feeling of celebration. Importantly, the wines were served in pairs, and before each one was sampled, the taster was played either the sound of a cork popping, or a screwcap being twisted open.” Ignoring some of the silly headlines, the results seem to be best summarised by Wine Industry Advisor here: “Overall, participants rated the same wine as 15% better quality when served under a cork than a screwcap. The wine under a cork was also rated as more appropriate for a celebration (+20%) and more inciting of a celebratory mood (+16%).” This is actually quite interesting, but not exactly earth-shattering. If you give most people two glasses of the identical wine while implying that they are different they will often manage to find differences that do not exist, and here the sound of a popping cork was sufficient to swing the results a little bit in favour of the wine associated with the cork pop. But we are told nothing of the quantitative scale that was used, so the percentage increases are pretty meaningless. Neither are we told if the reported increases are statistically significant. And if the wines were actually sealed under cork and screwcap, an actual wine difference due to the closure could of course easily swamp any effect of a popping sound. Strangely, the razzmatazz surrounding The Great Cork Experiment does not get a mention in the media articles that discuss the results – presumably because it was not mentioned in the press release. The fancy event laid on by Bompas and Parr, takes very much a backseat and, again according to The Telegraph, it is now reported that the study was not just designed by Charles Spence, but conducted “by a team at the Crossmodal Research Laboratory headed up by psychologist Professor Charles Spence”. Perhaps this is because APCOR would prefer us to have forgotten the PR stunt aspect, and the details of what happened to the participants before they took part in the actual tasting. Those details I think are rather important. They are given below…. Again referring to The Drinks Business description of the event, slides 1, 2 and 3 say that before the tasting there is “a cork workshop, where visitors can paint and play with cork”, they can “also then see (sic) the sound a cork makes by placing it in the ‘pyramid synth’, which produces different noises depending on the colour and density of the material”, and they were later “invited to partake in a ‘brain scan experiment’, which uses brain activity monitors to test how a person’s senses are triggered by the rituals associated with wine drinking”. This is really not the sort of thing you would expose experimental participants to if you were serious if determining the effect of a cork-popping sound on wine preference. It is known as priming, and I am sure Bombas and Parr knew exactly what they were doing, and how it might bias the results. What Charles Spence’s part in that was, I wouldn’t like to speculate on. Hopefully his input was restricted to the design of the actual sound-playing and tasting. But, the event as a whole was an exercise in sensory branding, to associate the sound of a popping cork with good wine. 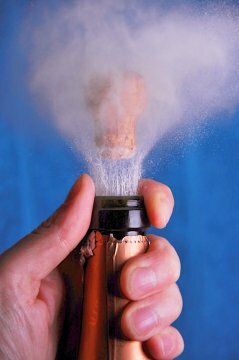 The popping cork is itself a form of priming where, to quote Wikipedia, “exposure to one stimulus (i.e., perceptual pattern) influences the response to another stimulus”. And the preamble activities seem very much also to be designed to increase the subjects awareness of cork, the popping sound, and its place in wine rituals. Fine as a piece of marketing, but science? Cynicism aside though, if the pop of a cork really is so important, there are lessons to be learned that are unrelated to the possible superiority of any particular closure. One is that in addition to all the other ritual associated with removing a cork, contrary to current sommelier training the cork should be extracted with such vigour that the blighter does actually make a popping noise. Or perhaps, in cases where the cork is too fragile, or Elfen Safety objects to Champagne corks flying across the restaurant, perhaps the sommelier’s phone could have an app with cork-removal sound effects. Of course, the experiment also suggested that the same app might work equally well with screwcapped wines. This entry was posted in Tasting and taste and tagged closure, cork, marketing, science, screwcap. Bookmark the permalink.